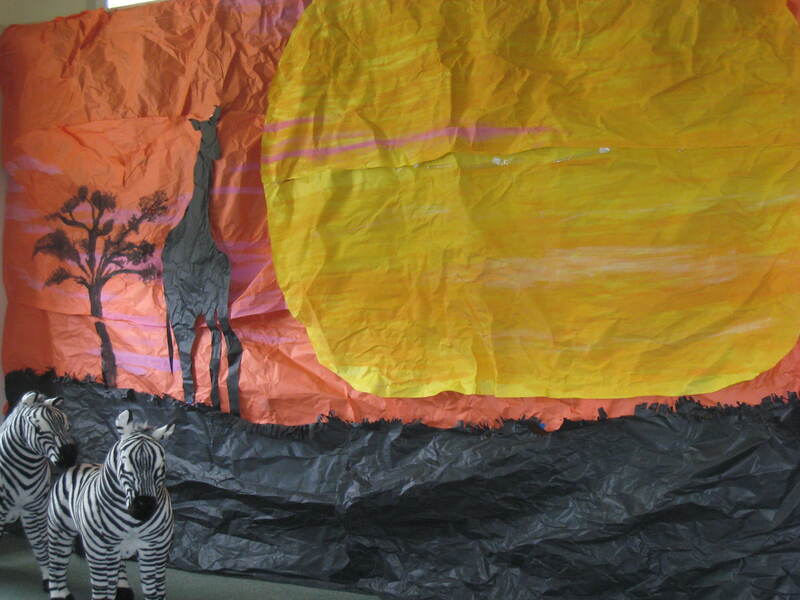 You have to see the Baobab Blast scenery at our church’s Vacation Bible School. 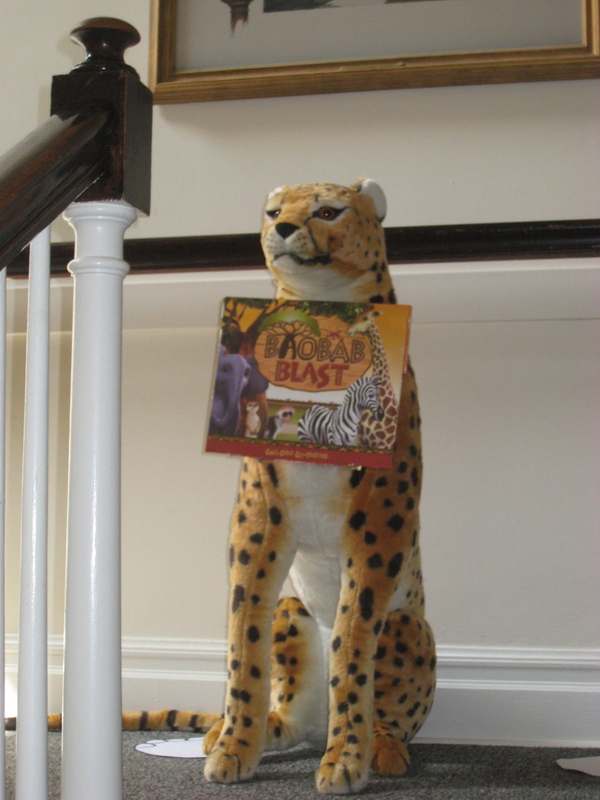 A friendly cheetah greeted me when I entered the Education Building this morning. 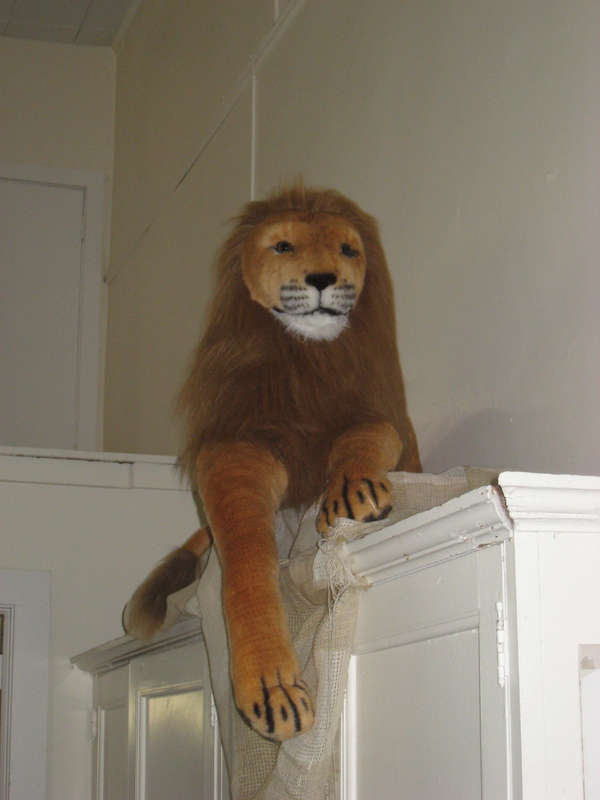 When I walked into the Education Building this morning to set up for the “Love Message in a Bottle” craft I was greeted by a denizen of the wild, the African wild that is. I followed large elephant tracks up the steps to the second floor Junior Room and walked in, stopping short on the threshold. The baobab tree at the far end of the room is enormous. The branches reached out to me as if to say, “Come in! Come In! You are welcome here in God’s country. Safe. Warm. Welcoming. It’s all that! And the kids love gathering underneath the baobab’s branches to hear a story, sing some songs and get to know each other better. 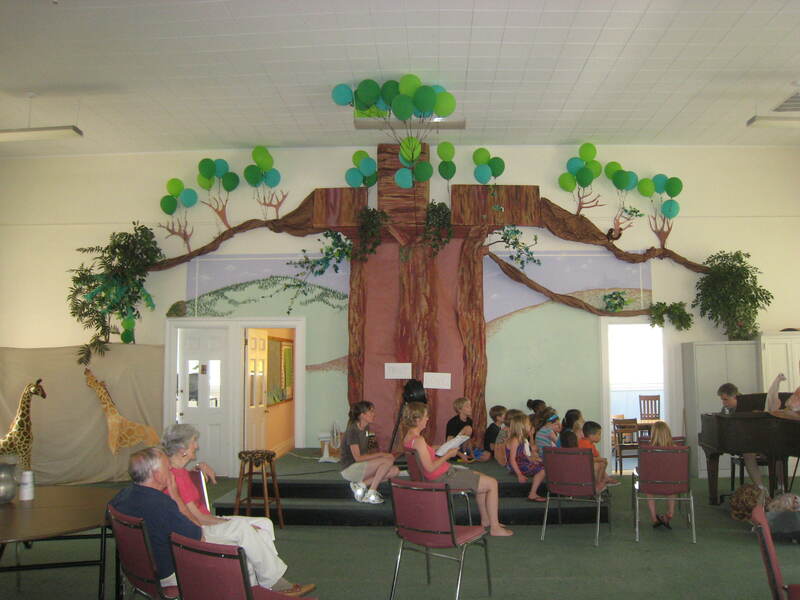 The baobab tree reaches out to welcome everyone who walks through the door. 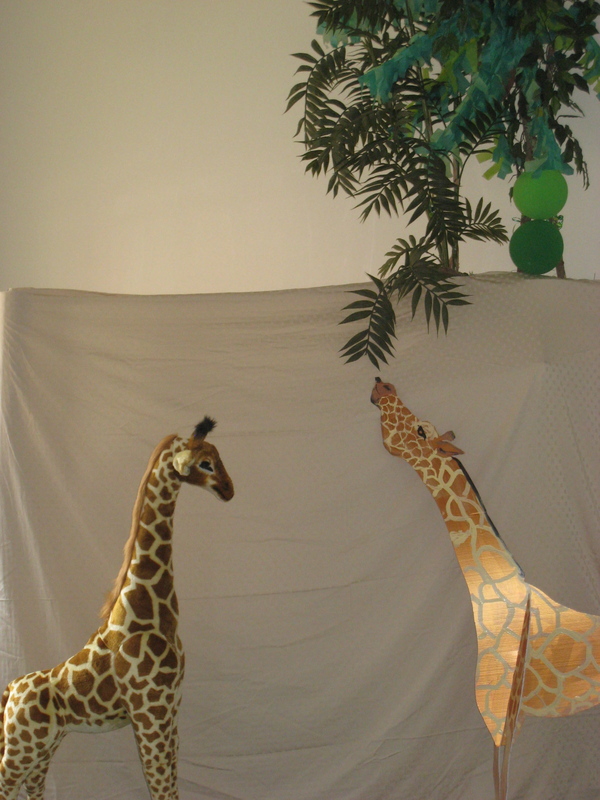 The giraffes, nibbling on low-hanging branches, are a welcome addition to the scene. These two giraffes look real from a distance! Feeling like someone was watching me I turned around. . .and looked UP, to find a lion staring DOWN at me, albeit in a friendly fashion. He watches over for those who walk through the door. Meanwhile, over in a far corner zebras roamed free, well away from the stomping feet of the elephants. The zebras hung out in an area all their own. And the elephants pretty much kept to themselves too. Circling the room I was transported. And I could see the kids felt the same way. How about you? wow!! who did all the artwork?? Our famous bass player’s wife did most of the background scenery; you know Diane, right? 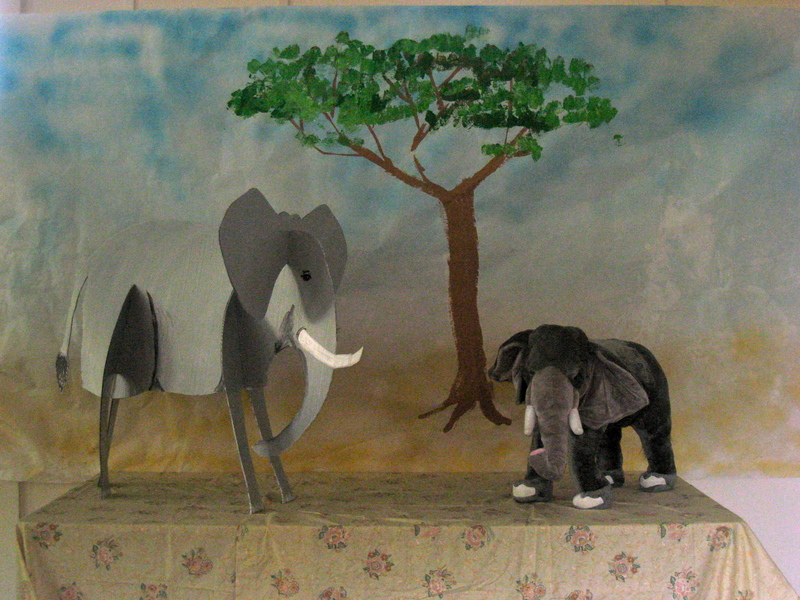 And Kathy did the baobab tree. . .using her usual thrift and ingenuity. I am so impressed with the results!